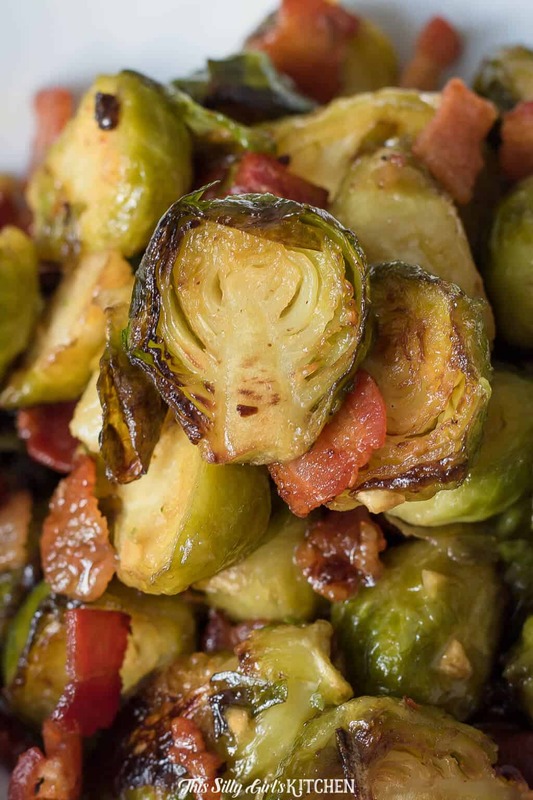 Roast Brussel Sprouts with Bacon tossed in a sweet and tangy glaze is sure to be a huge hit on any dinner table. 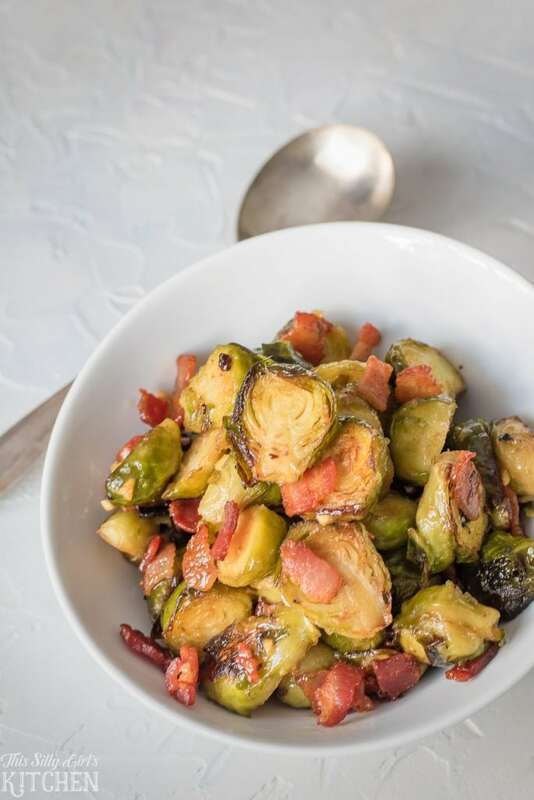 These Roast Brussel Sprouts with bacon are the perfect side dish for any meal. Oven roasted Brussel sprouts with bacon is my favorite side dishes ever, EVER. I don’t know what it is but I just love, love Brussel sprouts! We tend to have them at least once a week. Normally I will make them sauteed on the stove top with bacon, but since the holidays are right around the corner I wanted to experiment a little. I love trying to amplify everyday dishes to make them a little more special for gatherings. Using everyday ingredients like Brussel sprouts and bacon. What I did differently with this side dish was to toss everything in a sweet and tangy glaze at the end. The glaze is made from butter (yum! ), garlic, honey, apple cider vinegar, and dijon mustard. Take me to the recipe for Roast Brussel Sprouts already! If you would rather not hear my super helpful tips and tricks, FAQ, and my overall awesomeness and get straight to this delicious Roast Brussel Sprouts – you can very easily scroll all the way to the bottom of this post for the full printable FREE recipe! Bon appetit. 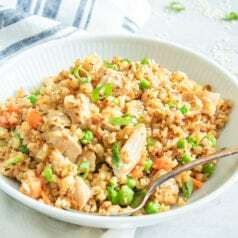 This glaze was the perfect touch to this everyday vegetable (try this Asian style glaze too!). I have to be honest though, these were still easy enough for any weeknight meal. Roasting the Brussel sprouts serve two purposes. One, it’s super easy, all you do is cut, toss, and roast them off. 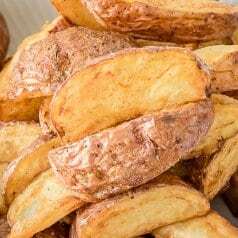 Two, you don’t have to worry about them burning on the stove, just place them in the oven, set a timer and forget about them, so easy and they come out slightly crispy! Why do you use frozen Brussel sprouts? They cook faster. Once thawed, they are already soft and when I’ve used fresh Brussel Sprouts in the past, they tend to dry out quickly. Drying out quickly means I’ve had to use more oil, bacon fat, or butter to compensate. More fat = more calories. They don’t have that funky cabbage thing going on as much as fresh Brussel sprouts do. Can I use fresh Brussel Sprouts? Of course! I suggest using an extra 1 Tablespoon of the reserved bacon fat when tossing them before roasting. Also, they will probably need an addition 5-10 minutes of cooking time. So, take that into consideration while making this recipe as well. How to cut Brussel sprouts? I cut them in half lengthwise right down the middle, exposing the inner ridges of the vegetable, while keeping them still intact. Why do you cut the sprouts in half? Do I have to do that? No, you can leave them whole if you want. 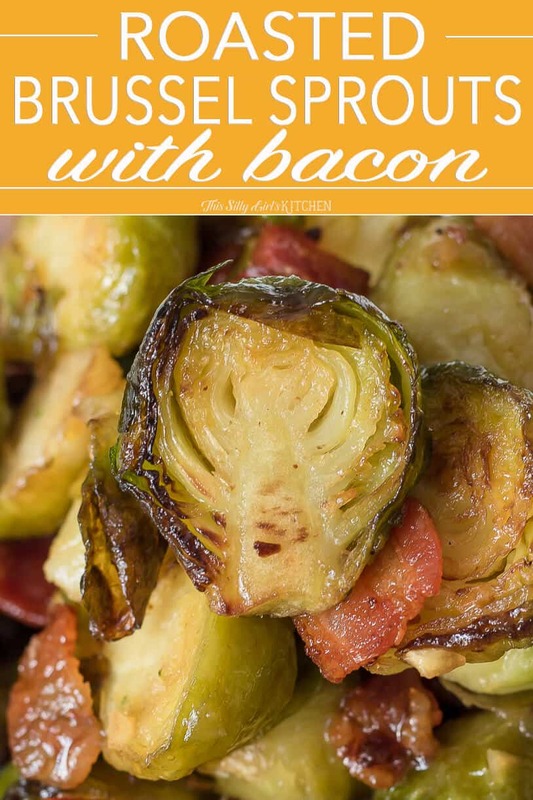 But, cutting them in half helps to get rid of any trapped gases, plus all the yummy bits of garlic, bacon, and the sauce can get all up in those Brussel sprout grooves! 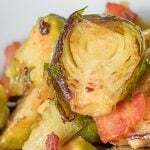 Roast Brussel Sprouts recipes are my favorite! Cook bacon, reserving any rendered bacon fat. Cut Brussel Sprouts in half lengthwise. Toss in bacon fat and salt. Roast until golden brown and delicious. Make the glaze by melting butter in a small pan on the stove top. Add additional ingredients including garlic, honey, vinegar, and mustard. Toss everything in the sauce, including BACON. 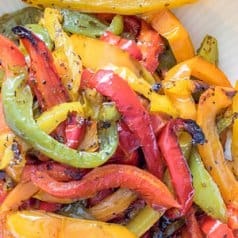 I absolutely love roasting vegetables, roasted peppersroasted peppers, Roasted Mushrooms with Garlic Butter Sauce, and Whole Roasted Romanesco Cauliflower are some of my go-to side dishes! Small Chef’s knife. A staple in every kitchen! A small non-slip cutting board, my favorite! Small pot to make the sweet and tangy glaze and to cut up some bacon. In a small pot over medium heat, cook the bacon until crispy. Drain bacon on a paper towel and reserve bacon fat. Preheat oven to 425°F degrees. In a medium-sized bowl, toss the Brussel sprouts with 2 tablespoons of the reserved bacon fat. Discard the remaining fat or save for future uses. Season with the salt. Place sprouts on a single layer on a baking sheet. Roast for 15-20 minutes flipping sprouts over halfway through. While the sprouts are roasting, make the glaze. In the same pot as you cooked the bacon, add in the butter and melt. Add the remaining ingredients and whisk to combine. 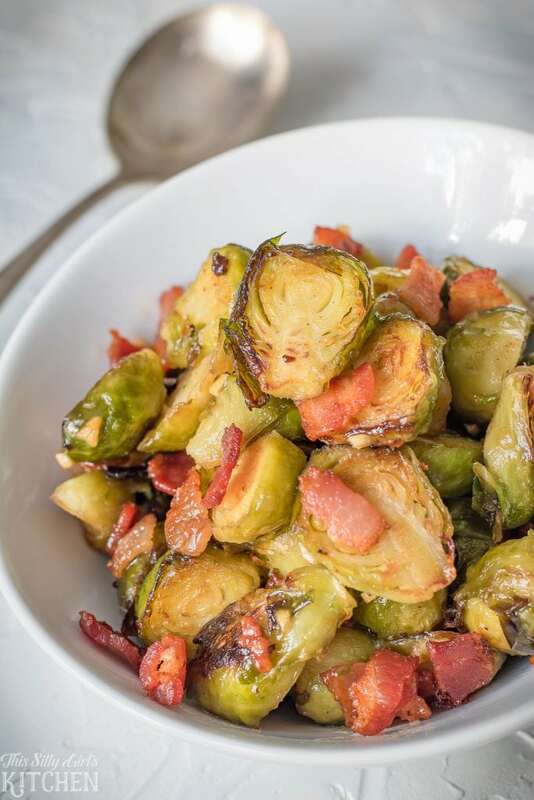 In a medium-sized bowl, add the cooked bacon, roasted Brussel sprouts, and sauce, stir to coat. Serve. Bacon is always a good idea!! My husband loves brussels sprouts- I’m trying this for sure!